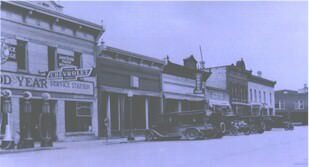 First Community Bank was originally founded under the name of the Farmers Bank. It opened its doors for business on July 17, 1911. The original officers of the Farmers Bank were John A Paul, President, John H. Owen, Vice-President and Alexander M. Paul, Cashier. Directors of the bank were John A. Paul, Alexander M. Paul, John H. Owen, S.C Chambers, August Lalk, and Wesley Winch. The Farmers Bank made it through the tough times of the depression of the 1930’s, falling security values and low farm prices. Due to the bank's successful management, the bank continued to grow and prosper. The Farmers Bank saw its first facelift in 1957. By the bank's 50th anniversary on May 6, 1961, the Farmers Bank held deposits of more than $3,250,000. The drive-up, originally located in the rear of the building, the walk up windows and the safe deposit vault were added during the 1969-1970 remodeling. The bank purchased the adjoining building to create more office space and nearly doubled in office size. In May 1982 the drive-up window was moved to the north side of the bank. The next major change to take place at the Farmers Bank was the selling of the bank to First Community Bancshares in 1986. This ended the 75-year era that the Paul family was associated with the bank. The Corporation then changed its name from the Farmers Bank to First Community Bank on May 4, 1989. With the remodel in 1997, we moved into the adjoining building. New offices were added to give additional space to our ever-growing bank. The bank has continued to grow with assets of $74 million in 2008. 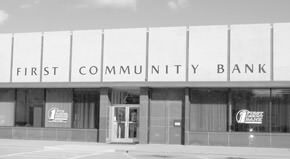 First Community Bank has been serving the community for over 95 years. We continuously seek to serve our local community to help it grow and prosper. First Community Bank strives to be a leader in offering our customers the newest in banking technology and products and to exceed our customer’s expectations for service.